Hey, let’s come up with another nutty idea and get some of that global warming grant money! Could we refreeze the Arctic? Scientists suggest radical solution to global warming. So what is it? Oh, they just want to inject reflective particles into the atmosphere, that’s all. Of course this is again all based upon those good old garbage in garbage out climate models the warmers all love to talk about as though they were the word of God when in reality most are at best, glorified computer games. Note their chart below and how they, of course, conveniently pick the highest and lowest times and the lowest date and completely seem to forget about all the other years in between and conveniently forget to show you what’s happened since September 16, 20112. In my opinion this could easily leave one with the impression that first, there was all this ice, now it’s all melted and it’s not coming back. Egads! The sky is falling. Really now? 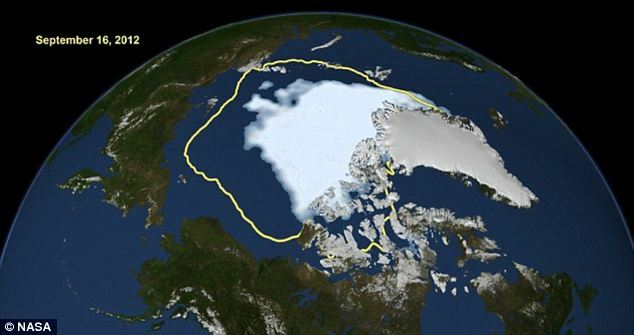 Is it really so bad we need to refreeze the Arctic? Ummm…..gee Mr. Scientist(s)….it refreezes every winter. Think not? Well look at the below chart. Just follow the red line folks. Oops! It’s refreezing all by itself! Imagine that. Note it’s also back up above the previous low year of 2007. For some strange reason there’s a funny smell. Hmmm…we have it! No, it’s not Teen Spirit. It smells like grant money!